Italian scholar; flourished in the second half of the sixteenth century. At the request of Immanuel di Fano, Jedidiah translated, in 1580, the "Moreh Nebukim" into Italian, under the title "Erudizione di Confusi." Parts of this translation, which is still extant in manuscript (Parma MS. No. 5), were published in 1892 by G. Sacerdote, under the title "Una Versione Italiana Inedita del Moreh," in the "Rendiconti della R. Accademia dei Lincei." 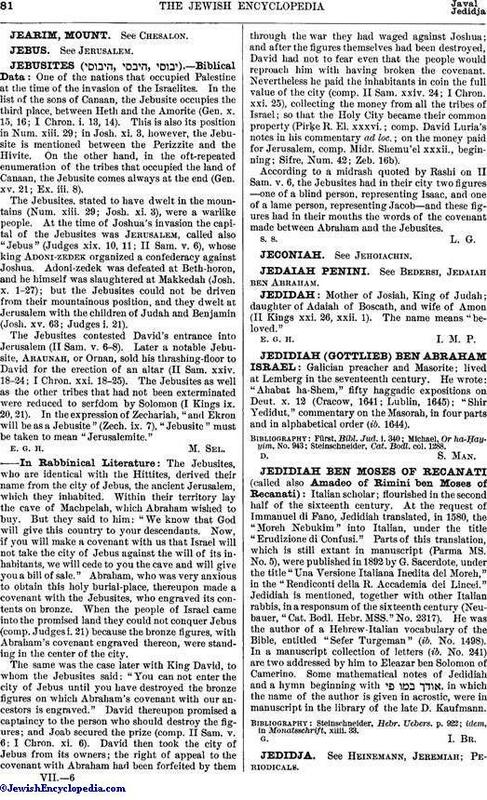 Jedidiah is mentioned, together with other Italian rabbis, in a responsum of the sixteenth century (Neubauer, "Cat. Bodl. Hebr. MSS." No. 2317). He was the author of a Hebrew-Italian vocabulary of the Bible, entitled "Sefer Turgeman" (ib. No. 1498). In a manuscript collection of letters (ib. No. 241) are two addressed by him to Eleazar ben Solomon of Camerino. Some mathematical notes of Jedidiah and a hymn beginning with , in which the name of the author is given in acrostic, were in manuscript in the library of the late D. Kaufmann. idem, in Monatsschrift, xiiii. 33.